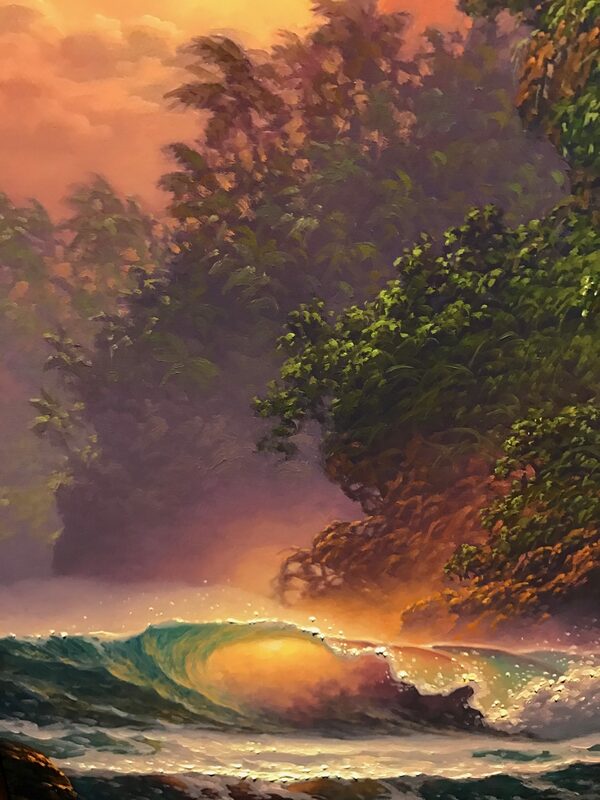 Roy Gonzalez Tabora portrays the endless variations of Hawaii’s beauty in his masterful seascapes. With works displayed in fine art galleries throughout the United States and Japan, he is recognized as one of Hawaii’s leading artists. Tabora’s work is a masterful blend of spontaneity and precision. Never content with merely recreating an observed scene or copying a photograph, Tabora draws from his heart and his mind. Painting from a combination of memory and imagination, he creates realistic works that are alive with rolling surf, distant mountains, and radiant skies. He is a keen observer of light, color, and the continuous motion of the sea. Each element offers endless variations of nature’s dynamic design. In Tabora’s art, every composition becomes a masterpiece of harmony, a poem of lyrical beauty. During his youth, he was directed by his favorite uncle, Rick Gonzalez. As with all apprentices, his days were occupied by sweeping floors, cleaning paint brushes and preparing painting materials, as well as receiving expert training in the traditional techniques of the old masters. Already an accomplished Realist at the age of twenty, he opted to continue his education, starting at Washington State University, and receiving his degree in fine arts from the University of Hawaii. He was soon discovered by Hawaii’s leading art galleries and has since risen to great renown as one of the finest seascape painters in the world. There is magic in Tabora’s work, a remarkable glow that seems to shine from an inner light. His colors are all at once subtle and intense. He achieves this through a long and painstaking process of layering and glazing. Tabora begins with a wash of turpentine and color. Then using oils, he under-paints the image. This is followed with five to ten applications of colors he calls transparent, each to bring out a greater sense of depth or tonal value. Each layer builds luminosity and light within the transparent waves. His highlights and glazes complete his paintings, resulting in works that enter our minds and become our dreams. “Rising with the Moon” Tabora’s art strikes a cord deep within, sending us to a mystical place where our imagination is free to wander amid our fondest memories. Ultimately we arrive at a moment of tranquility. To capture these moments and share them with his viewers–this is the artist’s highest aim and this is the true essence of Roy Tabora’s unforgettable seascapes. His original paintings and limited editions prints are highly prized by collectors for their irresistible qualities of majesty, mood, and meticulous perfection.